The Canon PowerShot SX720 HS features a whopping 40x zoom in its tiny body, making it ideal for travel photography, find out how it performs in our review. 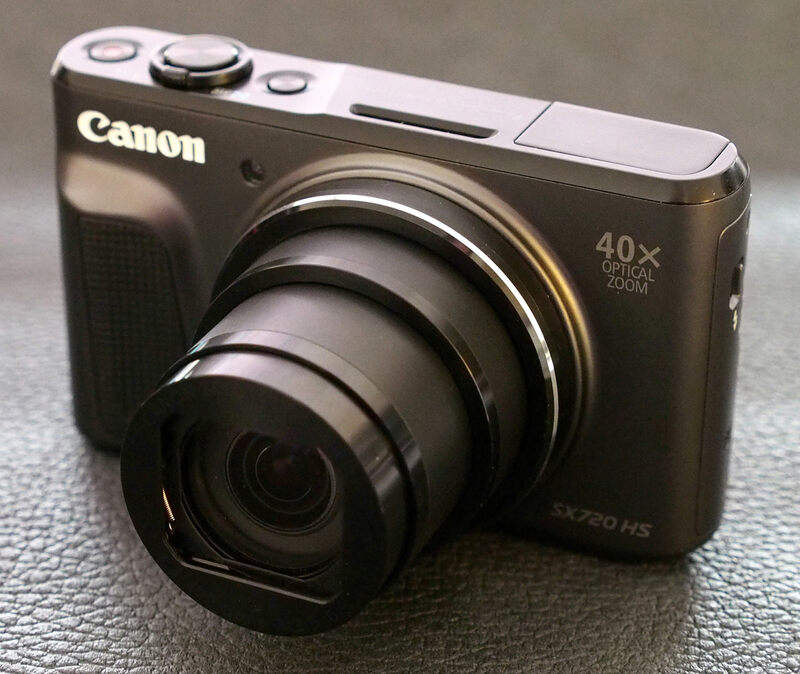 The Canon Powershot SX720 HS features a new 40x optical zoom lens, which gives the user 10x more zoom than the Canon Powershot SX710 HS has to offer without adding any extra bulk to the camera body. The lens gives the equivalent of 24 to 960mm in 35mm terms, and macro focus can focus on subjects as close as 1cm. ZoomPlus gives a further 80x reach to the camera which is just 35.6mm thick and the Advanced Zoom Framing Assist function will zoom in / out to compose your shot according to the number of people that are in the frame. The Powershot SX720 HS, which due to its size and lens reach is perfect for those who are fans of travelling, combines a 20.3 MP CMOS sensor with DIGIC 6 processing and an Intelligent Image Stabilizer is built in. 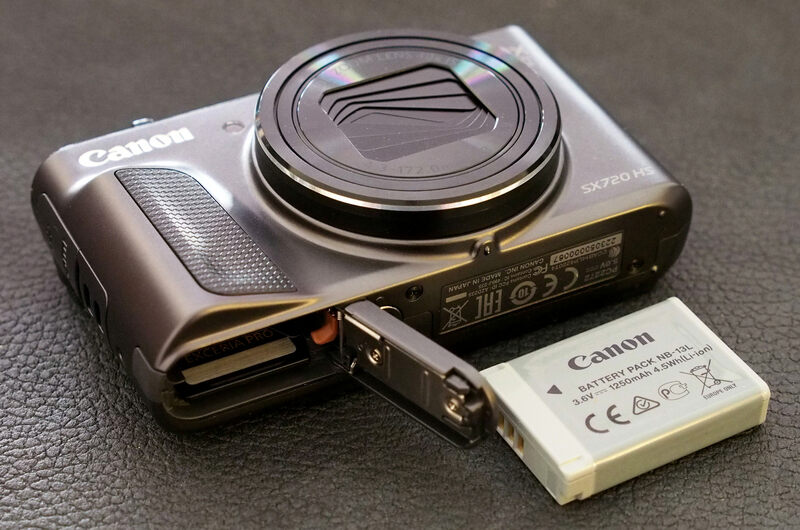 Full HD movies, up to 60p, in MP4 format can be captured and users can put Canon’s Dynamic image stabilisation and Auto Level feature to use when capturing film footage to ensure camera shake doesn't spoil the movie. There's also a Short Clip Movie function which allows users to select four, five or six-second clips from the footage captured which can then be played back in a variety of ways, including slow motion and double speed. MF peaking is available in both still and movie mode and a mode called 'Creative Shot' automatically creates five versions of an image with various filters and effects applied. There's also a Story Highlights mode which can be used to view footage without editing it and various photo effects are available. 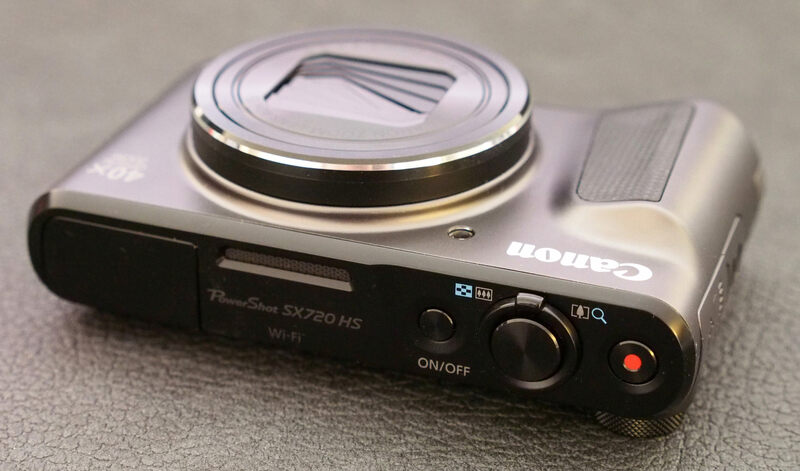 Dynamic NFC and Wi-Fi is built in and the PowerShot SX720 is compatible with the Canon app which can also be used to track where images were captured with the smartphone's built-in GPS and also as a remote shutter. 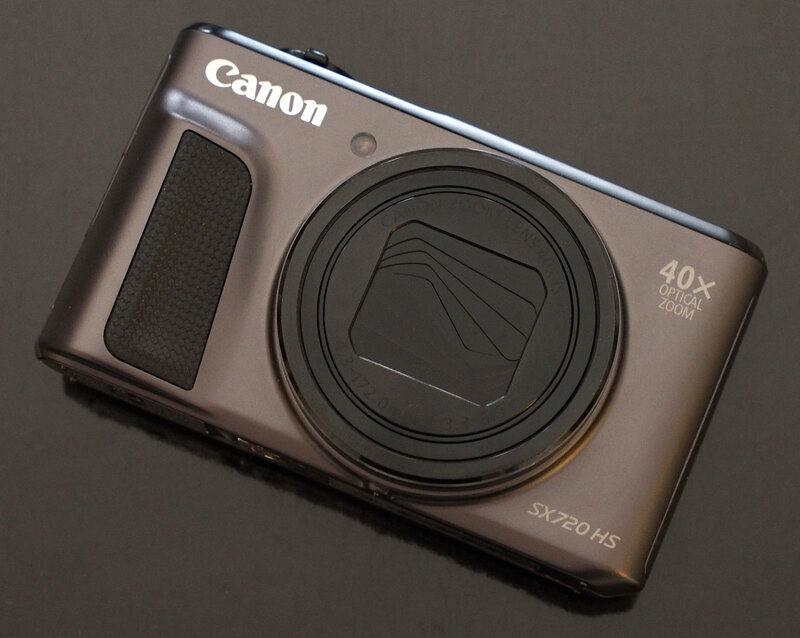 The Canon Powershot SX720 HS feels reasonably robust with a mostly metal body, and the raised grip found on the front of the camera's body helps to provide a secure hold of the camera, which is especially important, given the zoom range on offer. The grip is actually slightly larger than the one found on the SX710 HS and those who have used this particular compact will be familiar with the layout of the dials and buttons found on the SX720 HS as they're pretty much identical. A small rubber grip can be found on the back, next to the mode dial which allows you to set the shooting mode and on top is the on/off button, shutter release and zoom control. The base gives access to the battery compartment which fits a rechargeable Li-ion Battery that has an approximate shot life of around 250 on standard settings. The 3" monitor features approximately 922,000 dots, gives a 100% view and the brightness level can be adjusted to one of five levels, giving a good view of the scene. The screen is clear, bright and the menus displayed on it are well laid out. 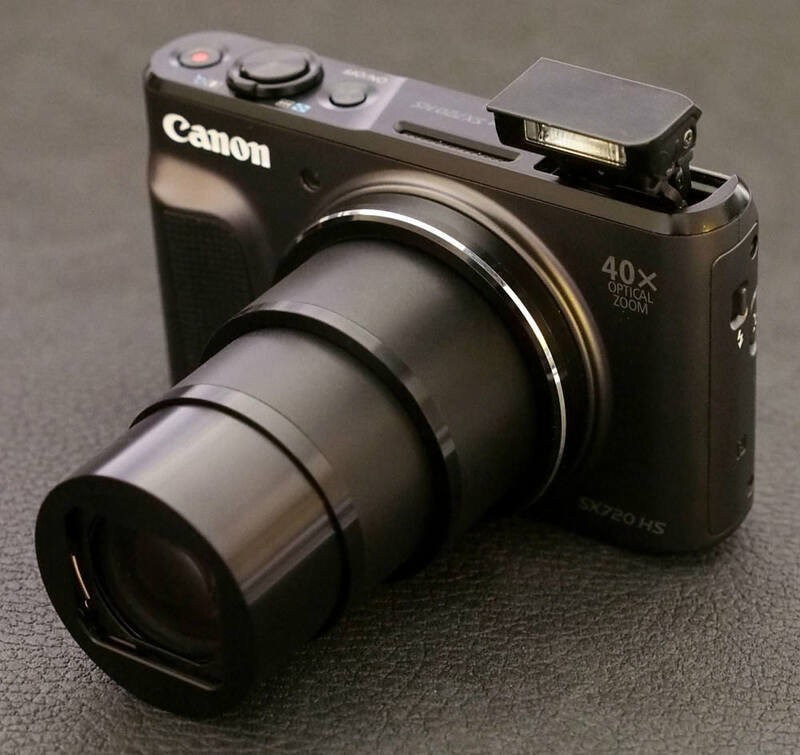 In fact, those who have used a Canon compact camera before will feel right at home with the layout, and the built in help will be useful for those new to the camera's options. Wi-Fi features - Using NFC it's easy to connect to an Android smartphone, and if you don't already have the Canon Camera Connect app installed, then the smartphone will automatically go to the Google Play Store where you can install it. 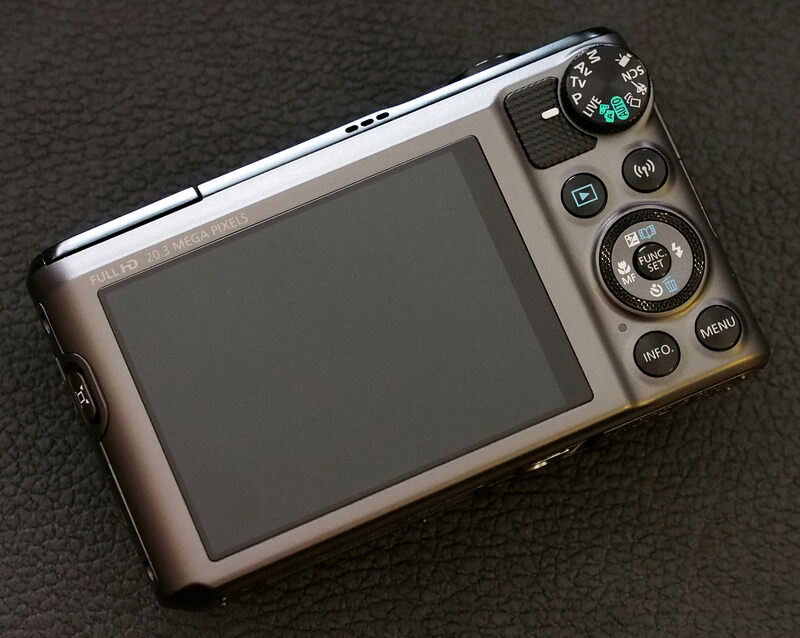 Unfortunately, when using remote shooting, you can't use the smartphone's touch-screen to set the focus point, although you can change AF settings. Connecting to an iOS device isn't as straightforward due to the lack of NFC, but you can quickly connect, as there is a dedicated Wi-Fi button on the camera. Battery life - The camera can shoot approx. 250 shots on default settings, according to CIPA / Canon testing, or with Eco mode approx. 355 shots. This is quite good if you leave the camera switched on to ECO mode, but the rest of the time, you'll be pleased to know that it's possible to charge the camera using a MicroUSB cable.